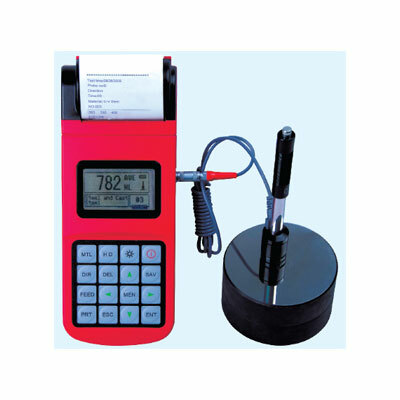 Leeb Hardness Tester PHT-200 - P is the widely used method to test the hardness of the metal. It is mainly used to test sufficiently heavy work pieces. The main aim of this product is to analyze the pressure of the Vessel, Steam Generator etc. India Tools & Instruments Co. is among the leading Leeb Hardness Tester PHT-200 - P Manufacturers, and known for their unique and modified designs. This is a portable product and can be used easily to delivers the accurate results. We offer a wide range of industrial products at a very affordable cost. We make sure to deliver the best quality to maintain a long life relation with our customers. Being the most excellent Leeb Hardness Tester PHT-200 - P Manufacturers, Suppliers, and Exporters, we offers customized product range to our customers. We make it easy for our customers to use our products; you can also get after sale customer support by our experts. We are here to help you out, send us your query and we will get back to you soon. Large screen(128×64 dot matrix LCD), showing all functions and parameters. • Test at any angle, even upside down. • Wide measuring range. It can measure the hardness of all metallic materials. Direct display of hardness scales HRB, HRC,HV, HB, HS, HL and three types of strength values immediately. • Seven impact devices are available for special application. Automatically identify the type of impact devices. Large capacity memory could store 500 groups (Relative to average times32～1 ) information including single measured value,mean value, testing data, impact direction, impact times, material and hardness scale etc. • Upper and lower limit can be preset. It will alarm automatically when the result value exceeding the limit. • Battery information indicates the rest capacity of the battery and the charge status. • USB port with the PC humanity multi-functions data proceeding software. • Original imported high speed thermal printer support the immediate printing function. It can save data permanently. • NI-MH rechargeable battery as the power source. Charge circuit integrated inside the instrument. Continuous working period of no less than 150 hours (EL off and no printing). • Auto power off to save energy.